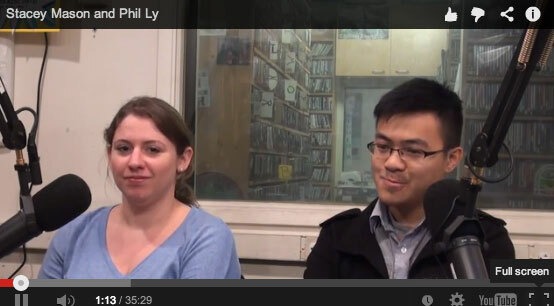 On April 16, 2014, graduating MFA students and interactive digital artists, Stacey Mason and Phil Ly came onto Artist on Art to talk about their work that will be shown in the 2014 Digital Arts and New Media MFA exhibition, undercurrents at the Digital Arts Research Center, UCSC, April 26-27 and May 1-4, 2014 from noon-5pm. The reception is May 1st from 6-9pm. Both Stacey and Phil work with games. Stacey focuses on interactive literature in her piece and installation, Between the Cracks which explores the boundary between hypertext fiction ebooks and video games. Phil’s video game and installation piece, Interrogation uses both virtual and reality to create the space in which a person can feel “the other” in an uncomfortable situation.